The Visioning Group kicked off its Listening and Engagement tour at the CW Corporate Council meeting on July 23, 2018. The purpose of this tour is seekingto learn both how people in different places and walks of life value nature and see it as promoting quality of life, and what people need to increase their access to nature and to improve local environmental health. The intended outcome isa firm and broad commitment to the foundations of the Chicago Wilderness alliance, including science-based and resilient land management, engagement and education on conservation and quality of life, and ever-increasing grassroots stewardship of local nature, important places, and nature corridors that connect these places. The next step will be engaging CW members at regional meetings. To improveeffectiveness, the Visioning Group is looking for volunteers to host and assist with meetings, and to invite members interested in becoming more involved. The time commitment is estimated to be one or two calls before the meeting, and one follow-up conference call after the meeting. The Visioning Group is interested in holding events to update the membership on the progress of CW toward a full implementation of its mission. Their first Visioning Group presentation was held at NIRPC Environmental Management Policy Committee meeting onSeptember 6 at 9:00 AMat 100 Southport Rd, Portage, IN and was followed by apresentation on the Chicago Wilderness Oak Recovery Project by Christopher Mulvaney. Anyone interested in joining the Visioning Group or assisting with the regional meetings is encouraged to reach out to Aaron Durnbaughatadurnbaugh@luc.edu,Daniel Suarez atdsuarez@audubon.org,or Debra Moskovits atdmoskovits@fieldmuseum.orgfor more information. As you know, the Steering Committee was formally established in January. There are several changes coming, and also a need to get to a place where there are staggered terms so the Committee terms don’t all start and end at the same time. At-Large Steering Committee Member Position:A Steering Committee member with the appropriate interest and capacity will be designated to coordinate key functions, including Membership Recruitment and Retention; Public Programs (e.g. Excellence in Ecological Restoration and other outward facing programs); External Communications; and Strategic Initiatives. Time commitment: Term begins with the January 16, 2019 Chicago Wilderness meeting and runs for 3 years. Attend quarterly Chicago Wilderness Executive Council meetings. Attend quarterly Steering Committee meetings. Conduct pre-work ahead of the meetings (setting agenda, outreach with members, committees and working groups, etc.). Other projects as assigned. Interested?For more information contact Lynne Westphallwestphal@fs.fed.us,Lynne: 224-999-1992;or Lynda Lancasterlynda_lancaster@nps.govLynda: 219-928-8677. Steering Committee Conference calls will be set for the first Wednesday of each month at 10 am for one hour. 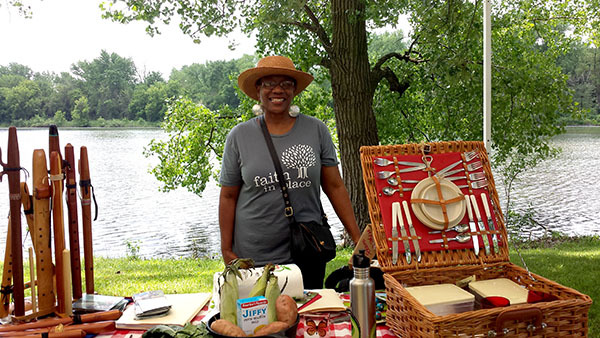 When Veronica Kyle, founder of the Chicago Wilderness Force of Nature Award winning program Migration & Me, began working on environmental issues years ago, she didn’t find a lot of other African Americans around the table with her. As part of her role with Faith in Place, she remembers listening patiently as her collaborators discussed their theories on why more African Americans were not involved in the parks, particularly in stewardship or outdoor recreational activities. “I would hear things like ‘they’ don't really do nature or hiking or come outside or ‘they’ like to stay close to their community,” recalled Kyle. “I knew that story had another side to it.” Kyle, who was born in Alabama and moved to Chicago as a child, remembered men who fished and hunted and women who gardened, canned, and made quilts outside while sitting on their porches or under huge weeping willow trees. During her later experiences working in Jamaica and South Africa, she saw how the oceans and nature interconnected with daily life. Kyle recognized these incorrect assumptions and stories about why black people were not engaged in their local parks and forest preserves, and she felt the situation lacked some “real, raw truth-telling.” Historical factors that African Americans and other diverse people have faced, like being run off of Chicago beaches, shot in local woods and preserves, or forced from their land in the South, were not being recognized by the broader environmental community. Not to mention that the land had been taken from indigenous people before that. “It’s painful for some to admit that even the land we now steward may have been taken or stolen from those who came before us to this country,” she said. Finally, at a meeting, the discussion came up again. How do we get diverse people involved with nature? “They weren’t asking me,” Kyle recalls. “And, I thought, ‘Did you invite diverse people? Was it a real invitation?’ And a few people said in a kind of dismissive way, ‘That will probably never happen.’” Kyle went home that night with these concerns on her heart, and by morning she had her answer. Inspired by what she learned from US Forest Service Program Specialist Mike Rizzo about the monarch butterfly’s 3,000-mile migration -- from Mexico to Nova Scotia -- she saw the stories of African Americans and Mexican Americans aligned in that same journey. “What if I started a story circle in churches and everyone got to tell their migration story and how nature was a part of it?” Kyle recalled thinking that evening. Everyone has a migration story, just like the “amazing” insect, whether it’s from the south to the north or from the city to the suburbs or from apartment to apartment. She was convinced this could be a way to bring diverse stories into the environmental movement. At the request of the nursery industry, the Chicago Region Trees Initiative (CRTI) and the Oak Ecosystem Recovery Group has been working with conservation partners in the region to identify a short list of native trees and shrubs that the conservation community would like to see more readily available from nurseries, especially as oak recovery ramps up in the coming years. The group is in the last stages of finalizing that list. Once complete, the partners will follow-up with the nurseries to discuss opportunities for increasing the availability of these species. A group of CRTI and Oak Recovery partners are working on developing resources to support the removal and control of buckthorn/honeysuckle by private landowners. Among the resources being developed is an infographic for homeowners that will illustrate several replacement species for buckthorn. The list of suggested replacement species will be aligned with the list of priority native trees and shrubs identified for the nursery industry, described above. The goal is to create an easy to use and visually appealing handout for homeowners that they can then take to their local nursery to purchase the recommend replacement options. The Chicago Region Trees Initiative continues to promote theWitness Trees Project,which seeks to engage residents across Illinois in the search for remaining witness trees (many of which were oaks or hickories) from the original public land surveys of the 1800s. To date, participants have evaluated a total of 269 trees, 34 of which have been tagged as potential existing witness trees, though further verification is needed. The project is meant to engage residents in an exploration of the natural history of their local area. Discussions are also underway with researchers to explore opportunities for utilizing the data to better understand the historical conditions of our oak woodlands and what that might mean for current management practices. Join us to raise funds for habitat and the plants and animals that call these places home. Enjoy a dinner surrounded by the forest with good music, great food and opportunities to get up-close with nature. RSVP by Sept. 10. Business-casual attire requested. $100 ticket For more information or toregister,Click Here. The City of Waukegan is soliciting proposals for a long-term partner to hold and/or co-manage a conservation easement on approximately 12 acres of accreted sandy beach on the Lake Michigan coastline. Do you love this newsletter? It’s easy to keep it going! Just remember to submit your committee updates, events and other newsNO LATER THAN the second Friday of each month. Submit news updates atwww.chicagowilderness.org. Under the News & Events drop down menu, select "Submit Program Updates" to access the easy-to-use form. Submit bullet points or a rough draft if that’s all you have time to do. The Communications Committee will be happy to work with you to develop a final report. 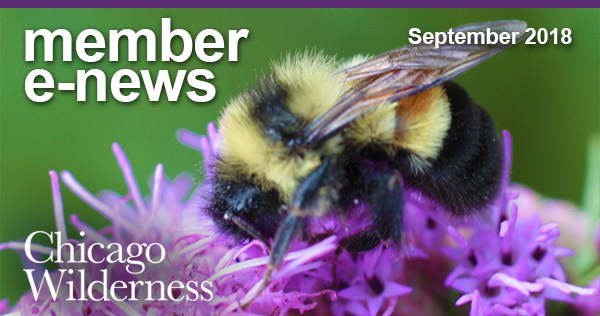 Submit Your Articles and Photos to Chicago Wilderness e-news! Are you interested in submitting a conservation-related article or photo to Chicago Wilderness for publication? Contact us atCWCommunicationsTF@gmail.comfor more information. The Chicago Wilderness Communications team is seeking volunteers with community engagement or communications experience. For more information, please send an email toCWCommunicationsTF@gmail.com. SPECIAL THANKS … TO YOU! On behalf of the Chicago Wilderness Steering Committee, we would like to express our gratitude to you for generously giving of your time, talents and resources. 4. go to the "my profile" green box on the right-hand side of the screen and click "Membership Information"
5. under Membership Information you can view invoices/transactions paid or unpaid. 6. to pay - click "the credit card icon" and complete the form "Update Payment & Billing Information"
Questions regarding dues payment(s), pledge(s) and invoice(s), should be directed to Jack Bittner, accountant supporting Jim Jerozal at Nicor Gas.Phone: 630/388-3774 orjbittne@southernco.com. of the natural communities of the Chicago region through fostering theircompatibility with the human communities whose lives they enrich.